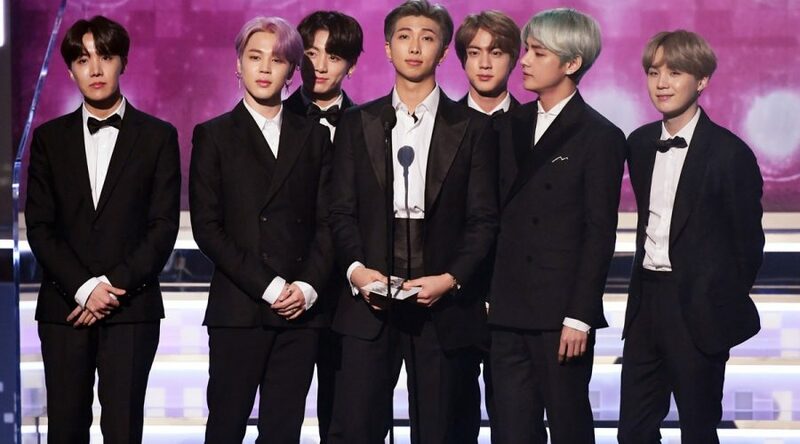 If you hadn’t already heard that beloved K-pop group BTS presented an award at the 2019 Grammys, I’m delighted to be the bearer of good news. Fans all over the world got to see BTS join American celebrities like Jada Pinkett Smith, Swizz Beats, and Nina Dobrev in presenting Grammy winners with their Gramaphone Trophy. These tweets about BTS presenting at the 2019 Grammys will make the ARMY so happy. When they announced H.E.R. as the winner of the award, she ran up to the stage and bowed down as she was handed the golden gramophone. Not only is this Suga, J-Hope, RM, Jin, Jimin, V and Jungkook’s first time presenting at the Grammys, but it’s also BTS’ first time getting a Grammy nomination. The group was nominated for Best Recording Package for their album Love Yourself: Tear. Other contenders in this category include St. Vincent’s Masseduction, Mitski’s Be the Cowboy, The Chairman’s The Offering, and Foxhole’s Well Kept Thing. On Feb. 9, the group posted a selfie video on their official Twitter page captioned "Let’s Go! Grammy!" In the video, the boys are all cheering and waving on an airplane (and looking seriously cute, if I might add). Just below the post is a Staples Center tweet retweeted by BTS that showed who they would be sitting next to at the Grammys. Ahead of the Grammys, fans all over the world tweeted their support and excitement about the exciting milestone for BTS. American fans in particular freaked out when the group landed in Los Angeles. Twitter user @iSwoonforJoohn tweeted, "BTS AND I ARE BREATHING THE SAME AIR!!!!!!" Needles to say, Twitter continued to go wild with BTS support after the boys presented at the Grammys. Though this is the group’s first time involved with the Grammys, it’s certainly not their first time stateside. The group came to LA in 2014 for their "Show and Prove" concert. In 2015, they visited San Francisco, Houston, and Atlanta as part of their "Highlight" tour. In the summer of 2016, BTS also attended two KCON (Korean convention) events in New York City and Los Angeles. In May 2018, the boys performed at the Billboard Music Awards, and back in August 2018, the group performed their first stadium concert in the U.S. at New York City’s Citi Field. They’ve also been interviewed by The Tonight Show host Jimmy Fallon, featured on Ellen (more than once), and featured on Good Morning America. BTS is seriously everywhere and it’s only a matter of time before they get even more popular in the U.S., especially considering that the group reached No. 1 on the Billboard 200 albums chart in 2018. Hopefully the group will get a nom for an album or song sometime in the near future of the Grammy awards, but for now the American and global ARMYs can enjoy BTS presenting awards. Heck, with all the awards these boys have, they’ll be totally ready to give an acceptance speech.